Celebrating the inspiring women in science at APOPO. Today marks the International Day of Women and Girls in Science. Over the past 15 years, the global community as has made a lot of effort in inspiring and engaging women and girls in science. At present, less than 30% of researchers worldwide are women. APOPO is dedicated to promoting women in all areas of our work, including the vital science that empirically informs and supports our life-saving rat scent detection technology. Many skilled scientists and engineers have contributed to APOPO’s endeavor since it began as a research project more than 20 years ago. Today, our Research & Development (R&D) activities are driven by a number of very talented women. 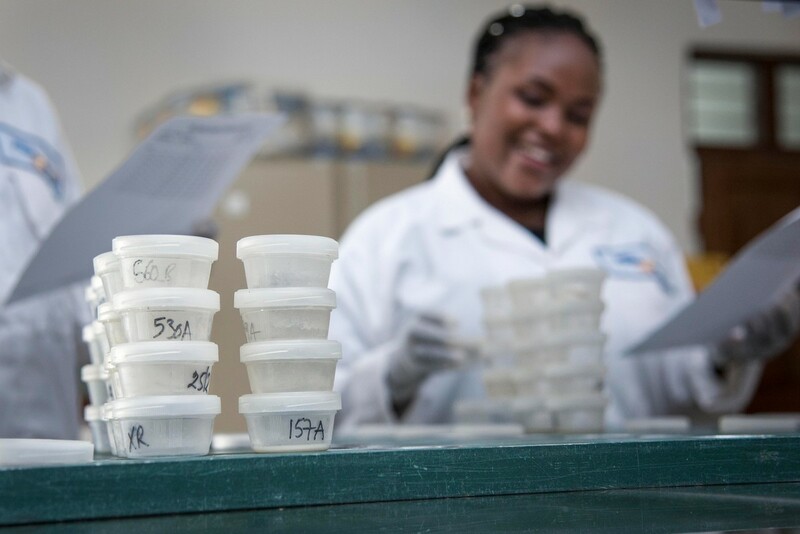 Through APOPO’s partnership with the Sokoine University of Agriculture's (SUA) Pest Management Centre (SPMC), APOPO has the opportunity to work with two female Ph.D. fellows who are being supported by SPMC’s African Centre of Excellence program. Tabia initially joined APOPO in 2012 and worked as a lab technician in Morogoro for 4 years before moving to Johannesburg in Jan 2016 to pursue a Masters degree. Tabia holds a MSc in Epidemiology from University of the Witwatersrand in South Africa, and a BSc in Biotechnology & Laboratory Sciences from SUA. Tabia is back at APOPO looking into the potential of African giant pouched rats to identify tuberculosis early in a prospective cohort study. The study follows up patients who have been tested positive by rats but negative by microscopy at both DOTS centers and APOPO’s lab. Norah holds a MSc in Clinical Research from Tumaini University-Kilimanjaro Christian Medical College University in Tanzania and a BSc in Biotechnology & Laboratory Sciences from SUA. She has comprehensive TB lab experience including molecular diagnostic methods. Norah is working on the bacteriological arm of the cohort study. Dr. Fiebig joined APOPO in July 2017 as APOPO’s Head of Tuberculosis. She is trained as an infectious disease epidemiologist (PhD) and veterinarian doctor and has substantial practical experience in TB epidemiology, surveillance and epidemic control gained through her work at the Robert Koch Institute, the national public health institute in Germany, and through WHO consultancies and research stays in various African countries. Her special interest lies in improving TB case finding, linkage to care, and prevention of spread through innovative approaches. "It is very important to us to inspire girls and women to choose careers in science and technology, e.g., through our presence at public events, to support their early steps through internships, and to guide women through their own ambitious scientific work such as a Masters or PhD project. TB is a complex problem, it affects young and old, women and men, and we can only benefit from being a mixed, diverse team to tackle it." Kate joined APOPO’s R&D team in Spring 2017. She was a lead researcher on several studies, including a project that explored alternative training paradigms. As part of the project, she developed a Rapid Retraining procedure that enables the HeroRATs to rapidly learn multiple odor targets. Kate also worked on an ongoing project examining if the rats can detect illegally trafficked wildlife products. Currently, Kate is based in the U.S. where she is pursuing a Ph.D. in Neuroscience at the University of Wisconsin- Milwaukee. She continues to work with APOPO as a consulting researcher. Ellie joined the APOPO research team in September 2018 after graduating from the College of Charleston (USA) in May. She received her Bachelor of Science degree in Psychology and conducted research developing novel models of stress induced alcohol consumption in rats; and also served as a student teacher in Statistics and Learning Theory. As a Research Technician at APOPO, Ellie supports all areas of ongoing research and manages a few projects of her own. The main goal as a team is to improve the training and performance of APOPO’s HeroRATs. Micaela joined the APOPO R&D team in Morogoro as a Research Technician Micaela holds a MSc. in Biology from CAECE University in Buenos Aires, Argentina where she conducted research on the serotonin reward system and its effect on learning in rats in collaboration with the IBYME institute. After studying genetics and molecular biology, she worked for 12 years in the clinical research industry helping to gather data on possible new treatments for a variety of diseases while ensuring patient safety and data quality. She also taught human behavior class to undergraduates at her alma mater. “I have kept rats as pets for over 10 years and love to be around animals, so when the opportunity for joining APOPO and working with African giant pouched rats came around, there was no doubt in my mind! I am currently working at our TB office in Morogoro, Tanzania, as part of the R&D team on a project called “sniff time” looking at the indication time for rats undergoing normal training for TB operations, compared to a defined threshold that determines a 'hit' with the goal of helping to improve overall rat training and performance. Dr. Schneider has longstanding expertise in rodent behavioral research and joined APOPO’s Research team in February 2018 as a Senior Researcher. She holds a Ph.D. in Behavioral Neuropharmacology, and completed her Venia Legendi in Neuroscience at the University of Heidelberg in Germany. She is currently involved in various research projects, including training of the African giant pouched rats in an olfactory discrimination task in an operant chamber, a study on the abilities of our rats to detect wildlife contraband, experiments aiming to develop strategies against extinction in operational settings, as well as basic research on habituation, socialization and feeding protocols. Leading the R&D and Training teams is Dr. Cindy Fast. Dr. Fast holds a psychology Ph.D. specializing in learning and behavior and behavioral neuroscience from UCLA where she received the Joseph A. Gengerelli Distinguished Dissertation Award and the Shepherd Ivory Franz Distinguished Teaching Award. While a member of the Behavioral and Systems Neuroscience department at Rutgers University, she used cutting edge neural imaging and pharmacology techniques to investigate the neurobiology of rodent olfaction in vivo, including how learning influences olfactory processing. Her research has been awarded the prestigious James McKeen Cattel Gold Medal from the New York Academy of Sciences and she has served as a mentor in the Global STEM Alliance Next Scholars program designed to increase the number and diversity of students in the Science, Technology, Engineering, and Mathematics (STEM) career pipeline. Join APOPO today in celebrating women like these who are leading innovation and research - may we see many more women and girls inspired to pursue STEM-related fields in higher education and careers in the near future! APOPO is most grateful for the generous support from partners and donors for our TB and research projects.